Sedentary muscles gain fat and lose tone. People commonly focus on exercising the body below the neck, but face and neck muscles also need exercise to stay fit, firm and beautiful. 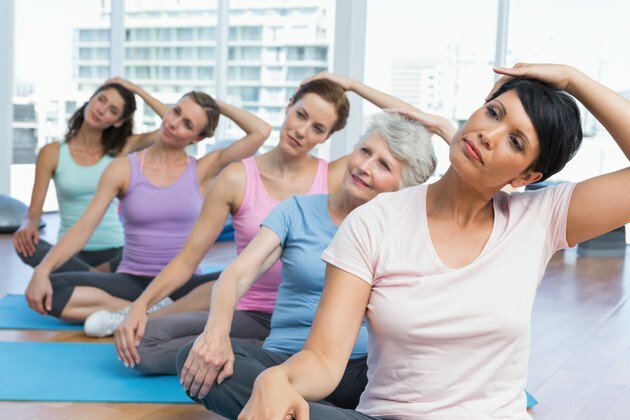 While it doesn't happen overnight, exercise can help you to achieve a more youthful appearance by combating sagging and drooping neck muscles and skin. Although eating fatty foods commonly contributes to a double chin, chewing sugarless gum can actually help tighten and tone sagging neck muscles and skin. Open and close your jaw repeatedly in a circular motion. Chew for 20 to 30 seconds, stop for 10 seconds and begin again. For slow but noticeable results, perform the chewing exercise at least three times per week. Marie-Veronique Nadeau, author of "The Yoga Facelift," promotes the cow face as an effective exercise in reducing jowls. It not only adds definition to a sagging jawline, but also supports blood circulation for a rosy glow. Allow your jaw to go slack so that your lips slightly open. Protrude your jaw and place your bottom front teeth over your top front teeth. Raise your left arm, turn your head to the right and look up toward the ceiling. Hold for 10 seconds, then relax your jaw. Repeat the movements again, but now hold the position for 15 seconds. Complete the exercise three times, lower your arms and perform three repetitions with your right arm. Like the cow face, the head raise stretches your neck muscles and works to firm sagging neck skin while stimulating blood circulation. Lie flat on your back, letting your head drop over the edge of your bed. Raise your head and attempt to place your chin on your chest. Hold the position for 10 seconds, then lower your head back down. Complete 10 repetitions. Annelise Hagen, author of "The Yoga Face," recommends the baby bird facial exercise to counter sagging jowls. The exercise also helps firm the chin, neck and cheeks. Tilt your head back and look up at the ceiling. Press the tip of your tongue on the roof of your mouth and swallow. Keeping your eyes on the ceiling, tilt your head slightly to the right and swallow. Now tilt your head slightly to the left and swallow. Repeat the exercise three to four times in each direction. Neck rolls not only release muscle tension, but also assist in toning the neck, throat and chin. Tilt your chin toward your chest. Rotate your head to the left, raise it up toward the ceiling and down to the right in a circular fashion. As you feel the release of tension, wrinkles in the throat area begin to dissolve.